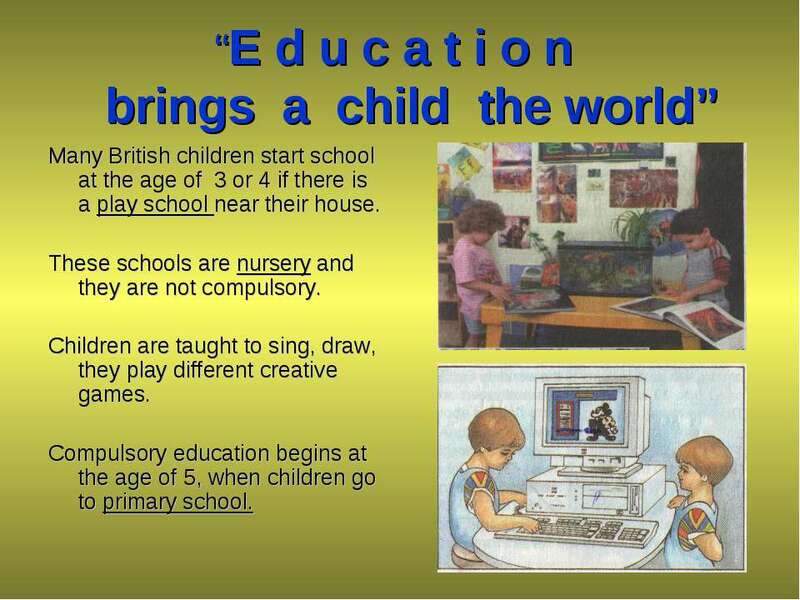 “E d u c a t i o n brings a child the world” Many British children start school at the age of 3 or 4 if there is a play school near their house. 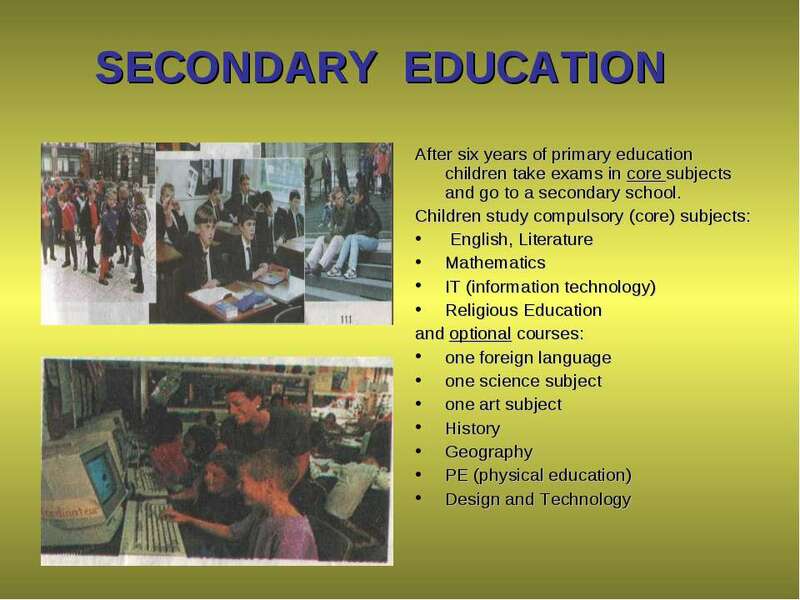 These schools are nursery and they are not compulsory. Children are taught to sing, draw, they play different creative games. Compulsory education begins at the age of 5, when children go to primary school. 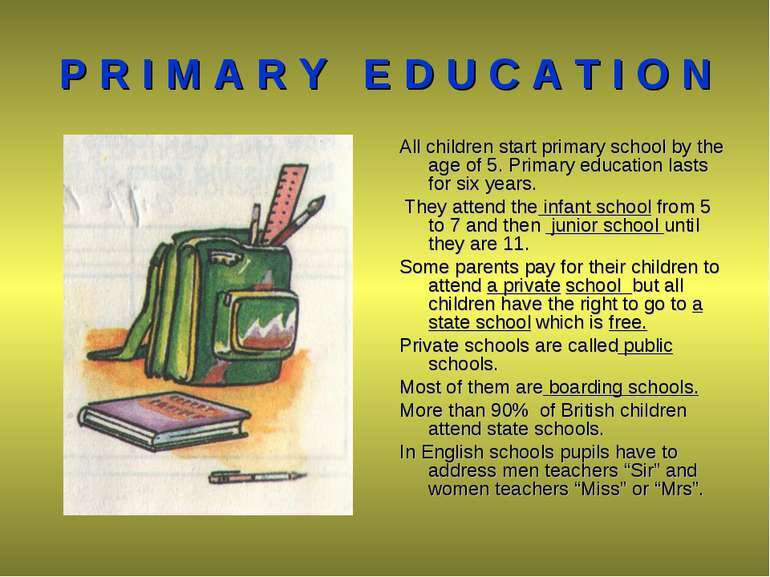 P R I M A R Y E D U C A T I O N All children start primary school by the age of 5. 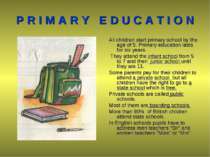 Primary education lasts for six years. They attend the infant school from 5 to 7 and then junior school until they are 11. Some parents pay for their children to attend a private school but all children have the right to go to a state school which is free. 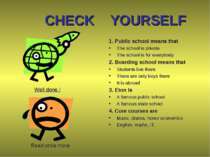 Private schools are called public schools. Most of them are boarding schools. More than 90% of British children attend state schools. In English schools pupils have to address men teachers “Sir” and women teachers “Miss” or “Mrs”. The most famous public schools in Britain are Eton, Harrow, Winchester. 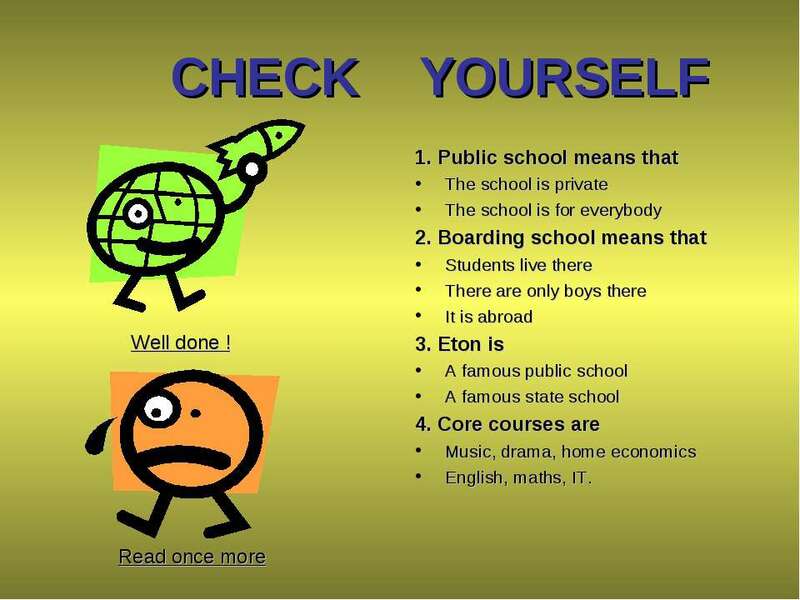 A year at Eton costs 17,000 pounds. It is very old, and a lot of important people used to be students there. It is an all-boys school. 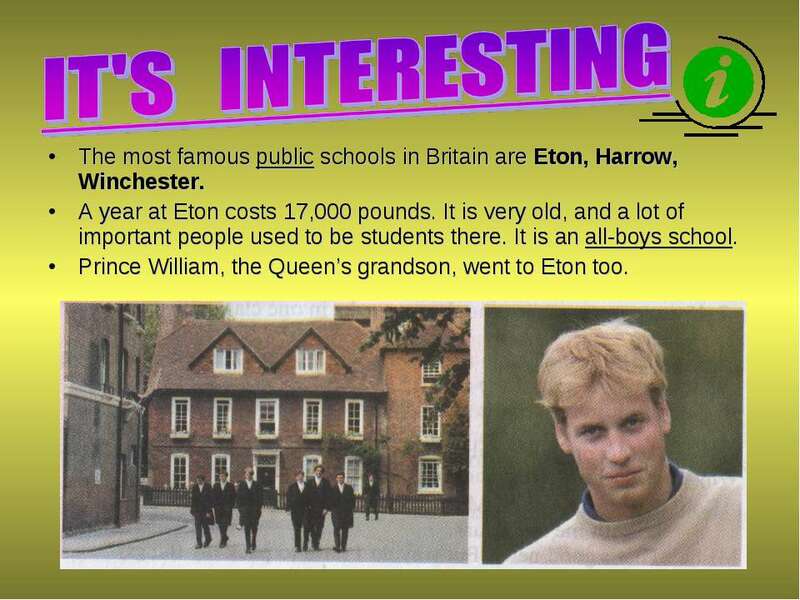 Prince William, the Queen’s grandson, went to Eton too. SCHOOL UNIFORM A lot of people think that school uniforms in England are for the children from rich families at the country’s best schools. 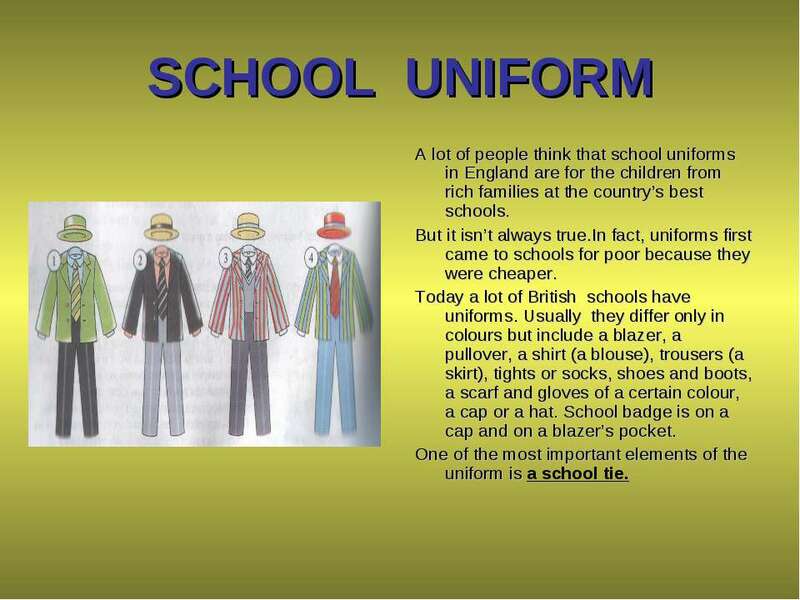 But it isn’t always true.In fact, uniforms first came to schools for poor because they were cheaper. 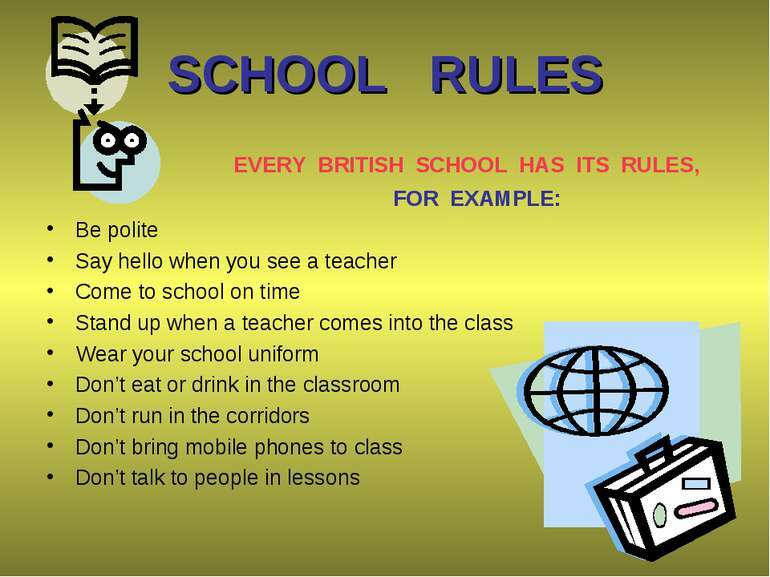 Today a lot of British schools have uniforms. Usually they differ only in colours but include a blazer, a pullover, a shirt (a blouse), trousers (a skirt), tights or socks, shoes and boots, a scarf and gloves of a certain colour, a cap or a hat. School badge is on a cap and on a blazer’s pocket. 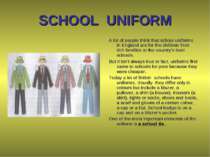 One of the most important elements of the uniform is a school tie. 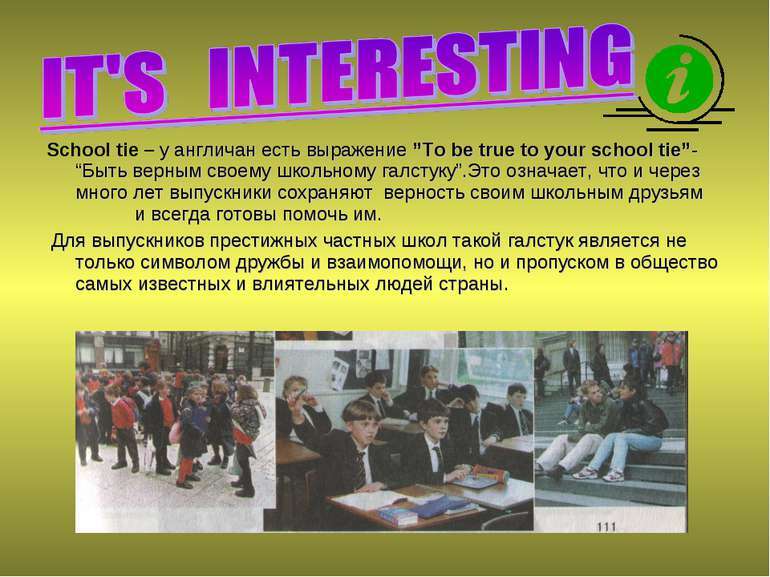 School tie – у англичан есть выражение ”To be true to your school tie”- “Быть верным своему школьному галстуку”.Это означает, что и через много лет выпускники сохраняют верность своим школьным друзьям и всегда готовы помочь им. Для выпускников престижных частных школ такой галстук является не только символом дружбы и взаимопомощи, но и пропуском в общество самых известных и влиятельных людей страны. 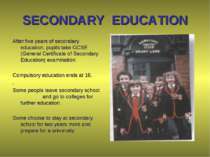 SECONDARY EDUCATION After five years of secondary education, pupils take GCSE (General Certificate of Secondary Education) examination. 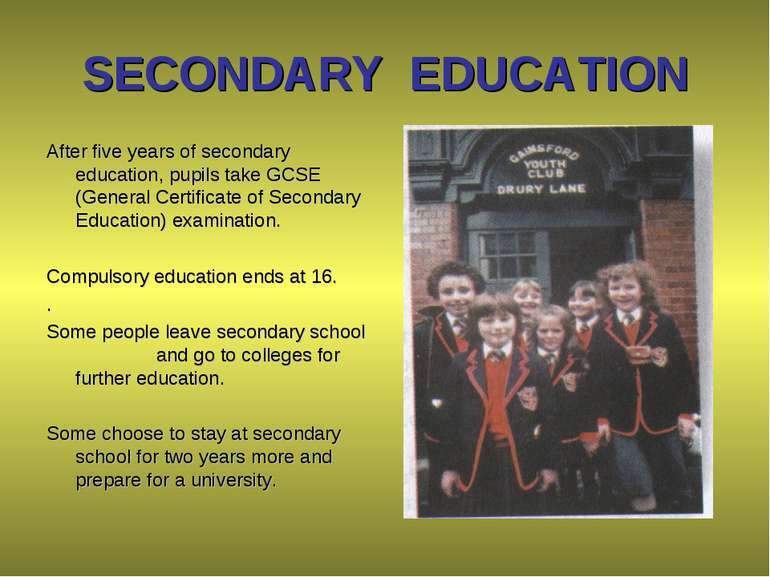 Compulsory education ends at 16. . 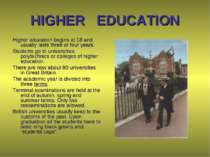 Some people leave secondary school and go to colleges for further education. Some choose to stay at secondary school for two years more and prepare for a university. 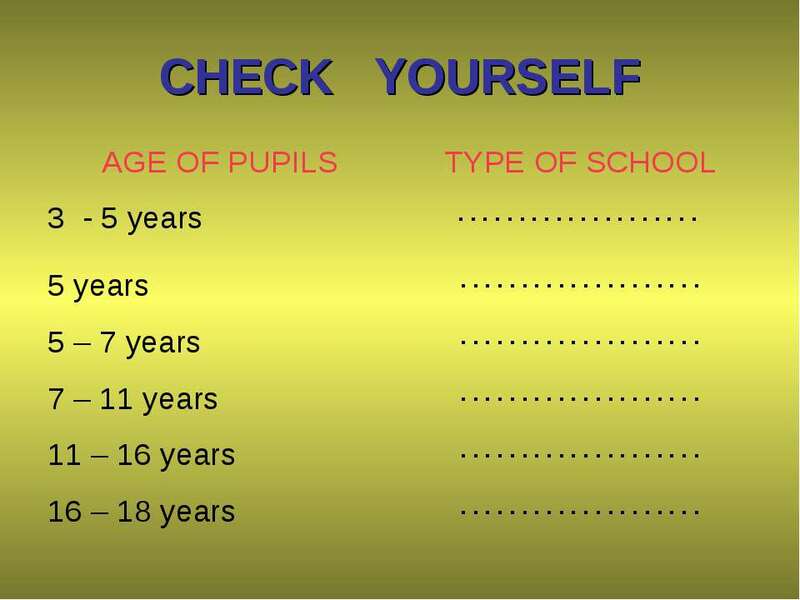 CHECK YOURSELF AGE OF PUPILS TYPE OF SCHOOL 3 - 5 years . . . . . . . . . . . . . . . . . . . . 5 years . . . . . . . . . . . . . . . . . . . . 5 – 7 years . . . . . . . . . . . . . . . . . . . . 7 – 11 years . . . . . . . . . . . . . . . . . . . . 11 – 16 years . . . . . . . . . . . . . . . . . . . . 16 – 18 years . . . . . . . . . . . . . . . . . . . .
HIGHER EDUCATION Higher education begins at 18 and usually lasts three or four years. Students go to universities, polytechnics or colleges of higher education. 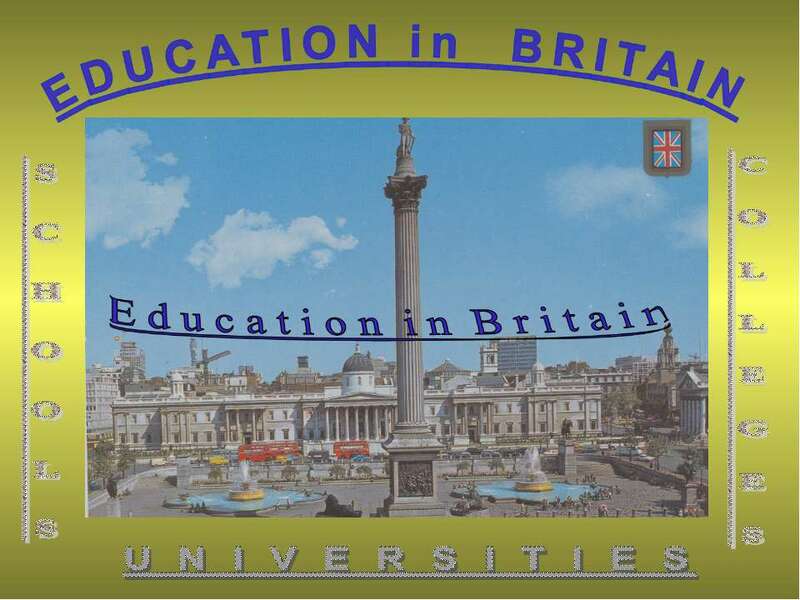 There are now about 80 universities in Great Britain. 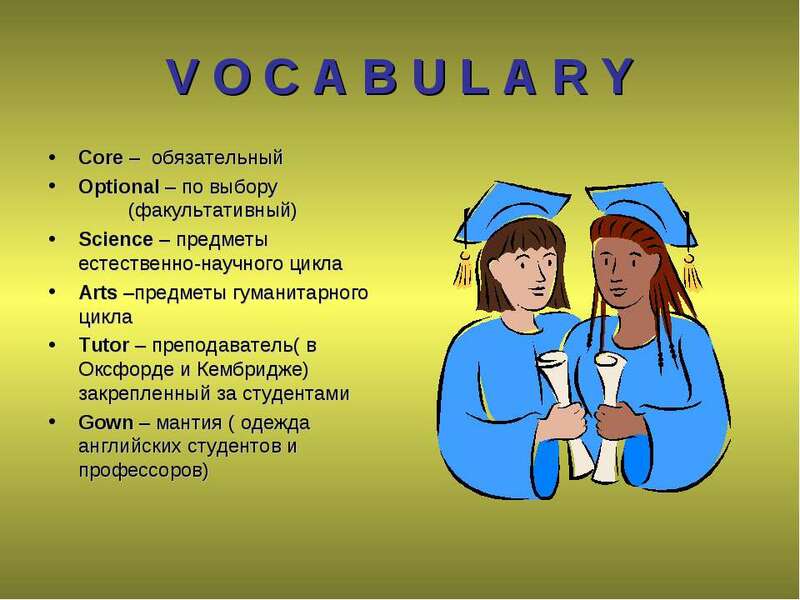 The academic year is divided into three terms. 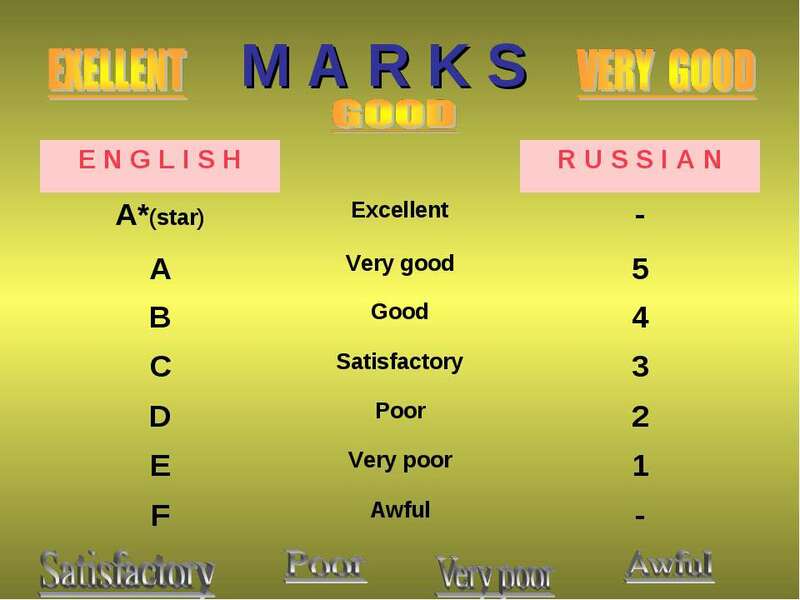 Terminal examinations are held at the end of autumn, spring and summer terms. Only two reexaminations are allowed. British universities usually keep to the customs of the past. Upon graduation all the students have to wear long black gowns and “students caps”. OXFORD AND CAMBRIDGE Oxford University is the oldest and most famous in Britain. 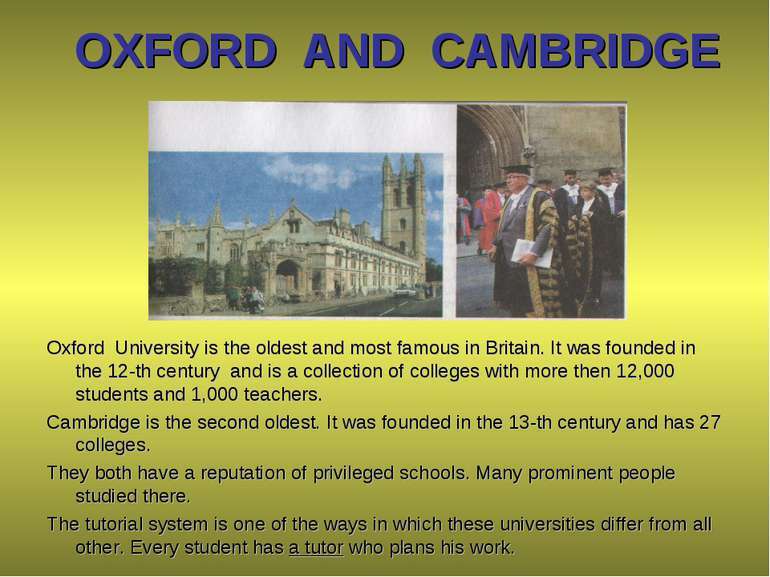 It was founded in the 12-th century and is a collection of colleges with more then 12,000 students and 1,000 teachers. Cambridge is the second oldest. 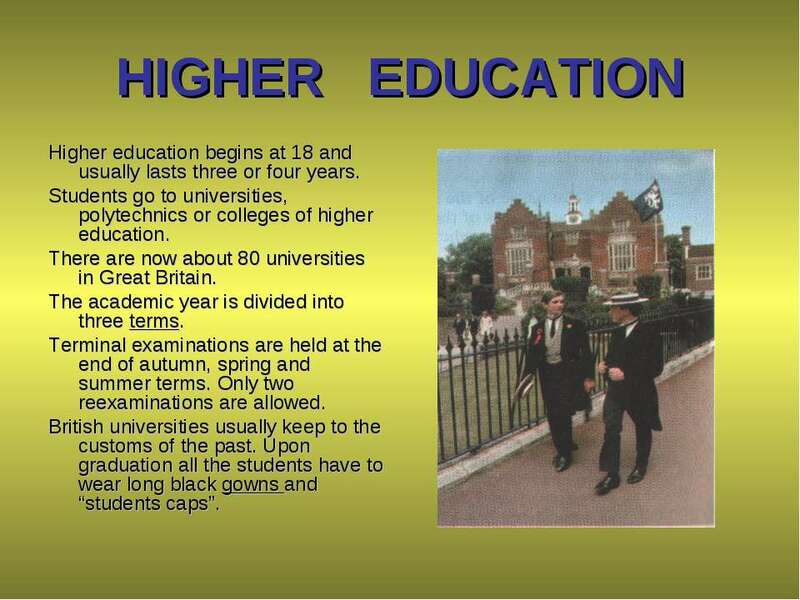 It was founded in the 13-th century and has 27 colleges. They both have a reputation of privileged schools. Many prominent people studied there. 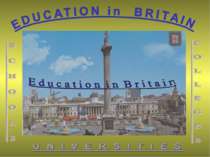 The tutorial system is one of the ways in which these universities differ from all other. Every student has a tutor who plans his work. 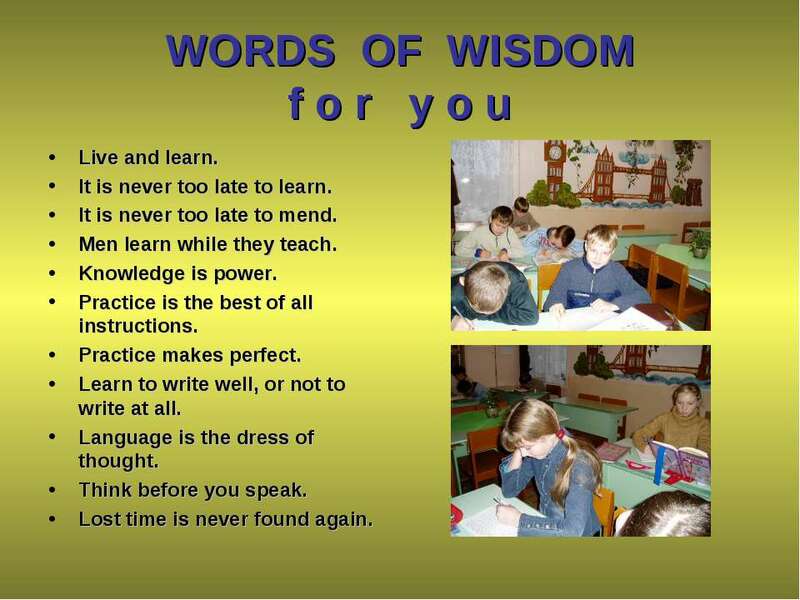 WORDS OF WISDOM f o r y o u Live and learn. It is never too late to learn. 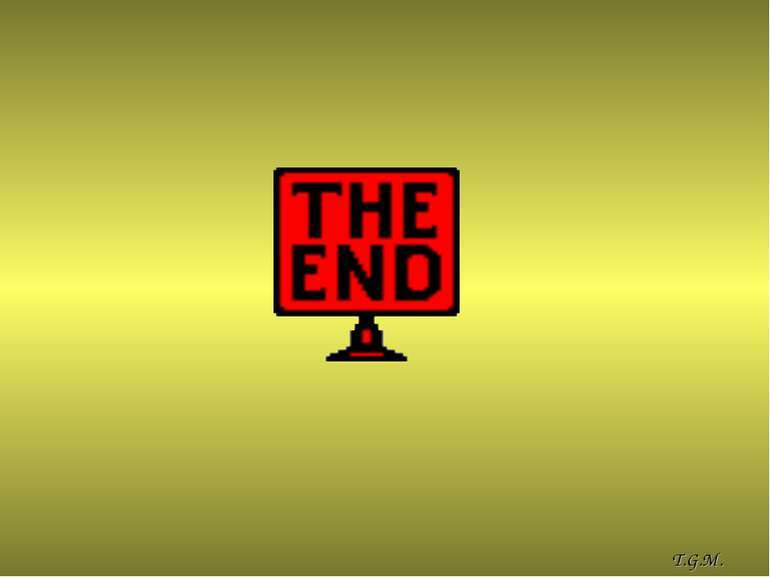 It is never too late to mend. Men learn while they teach. Knowledge is power. Practice is the best of all instructions. Practice makes perfect. Learn to write well, or not to write at all. 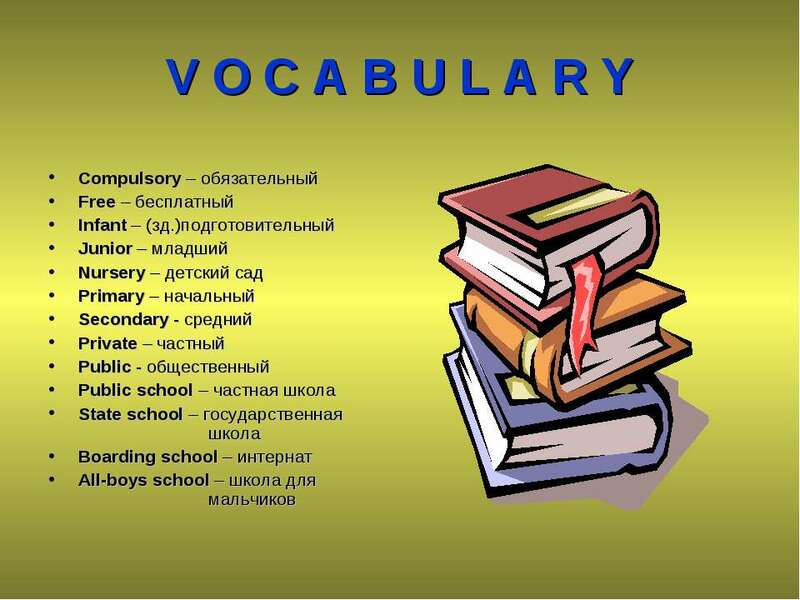 Language is the dress of thought. Think before you speak. Lost time is never found again. 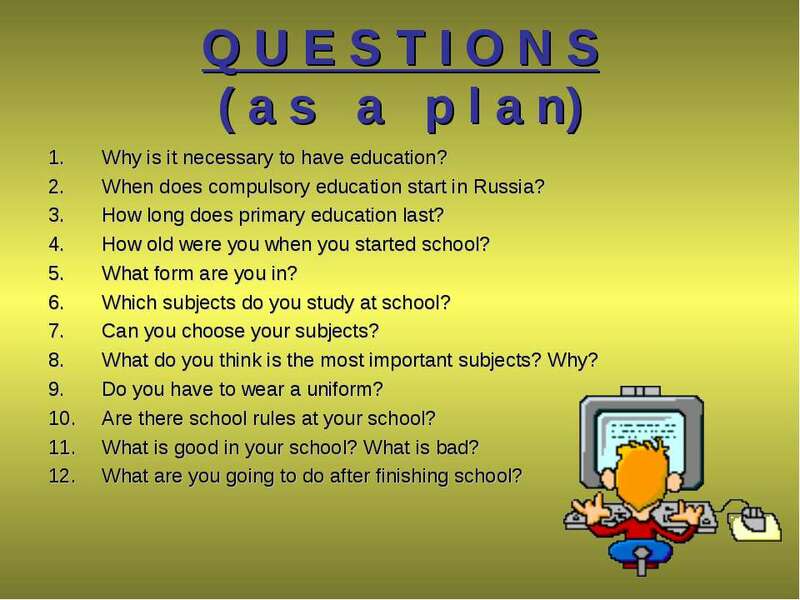 Q U E S T I O N S ( a s a p l a n) Why is it necessary to have education? When does compulsory education start in Russia? 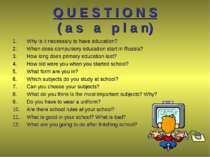 How long does primary education last? How old were you when you started school? What form are you in? 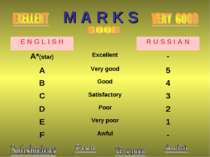 Which subjects do you study at school? 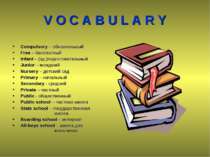 Can you choose your subjects? What do you think is the most important subjects? Why? Do you have to wear a uniform? 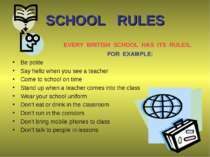 Are there school rules at your school? 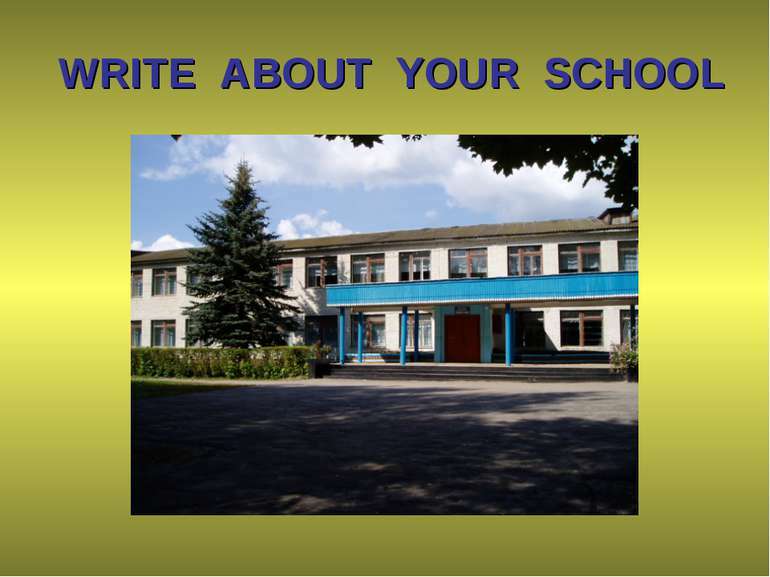 What is good in your school? What is bad? 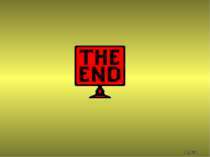 What are you going to do after finishing school? Hello! My name is Mike. I’m from Great Britain.